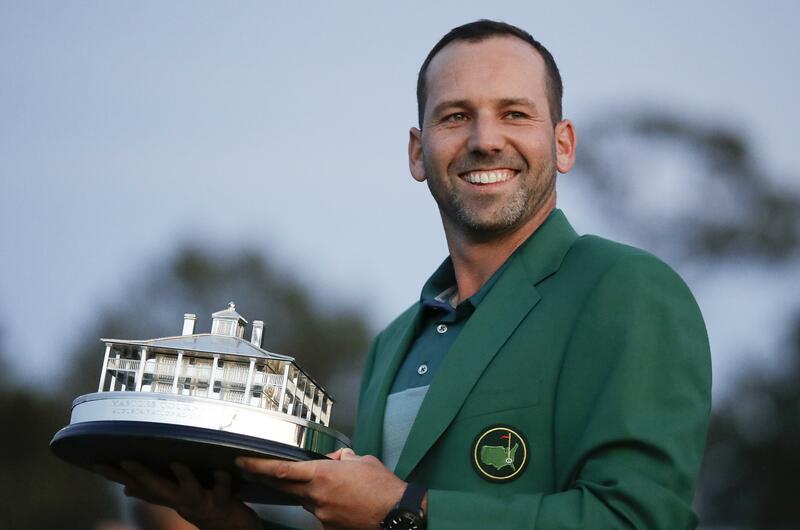 Mon., April 10, 2017, 8:09 p.m.
AUGUSTA, Ga. – Eighteen years and 71 majors later, more tears for Sergio Garcia. This time, they were accompanied by a smile. Sunday at the Masters was a most joyous occasion, far different from when Garcia teed it up in his first major as a pro in the 1999 British Open at Carnoustie. He was 19 and already heralded as a star and the most likely rival for Tiger Woods. Garcia was low amateur at the Masters that year. He shot 62 at the Byron Nelson Classic and tied for third in his pro debut on the PGA Tour. He won the Irish Open, and the next week he was runner-up to Colin Montgomerie at the Scottish Open. And then he shot 79-83 at Carnoustie and sobbed on his mother’s shoulder on his way out. Garcia never would have imagined then how long it would take for him to win a major, and he had reason to believe it might never happen. “It’s been such a long time coming,” Garcia said after his playoff victory over Justin Rose. No one had ever played as many majors as Garcia before winning his first one, so those tears were equal parts joy and relief. It showed. Phil Mickelson leaped – not very high – when he finally won his first major at Augusta National in 2004. Garcia, who only needed two putts from 12 feet on the first extra hole against Rose, crouched when his birdie putt curled in the back of the cup. He clenched both fists and shook them repeatedly. He shouted multiple times. He blew a kiss to the gallery as it chanted his name. He crouched one more time, placing his hand on the green and then slamming his fist into the turf. “It was just a lot of things going through my mind,” he said. Garcia is not the first player that endured bad breaks and heartache in the majors before finally winning one. Tom Kite won the PGA Tour money title twice and had played in 67 majors as a pro before he finally won the 1992 U.S. Open at Pebble Beach when he was 42. Corey Pavin was 36 when he hit that 4-wood onto the 18th green at Shinnecock Hills and won the 1995 U.S. Open. Mark O’Meara had 14 victories on the PGA Tour when he won the 1998 Masters at 41. Most different about Garcia is that he made it easy to root against him, blaming everything but his own shots and missed putts. There was that time at Bethpage Black in the 2002 U.S. Open when he complained about having to play in the rain, suggesting the USGA would have stopped play if Woods had been on the course. He lost a three-shot lead in the final round at Carnoustie in the 2007 British Open, and after losing in a playoff to Padraig Harrington, he said he was playing against “more than the field,” intimating that somehow, the golfing gods were out to get him, too. Losing hurt, and it reached a point where Garcia acted as though he no longer cared. That’s why his comments all week at the Masters that he had changed his attitude, that he was learning to accept bad bounces, was met with skepticism. What he found on Sunday, starting with his drive to the golf course, was a calmness he had never felt in the previous three times he played in the final group. And from that calm emerged the grit that Garcia had lacked. He salvaged par from a certain bogey on the 13th that kept him in the game. He made eagle on the par-5 15th to tie for the lead. He reached the 18th green and stood over a 5-foot putt for the victory. The last time he had a putt to win a major was at Carnoustie in 2007. He missed and had to go into a playoff. He missed this one, too, and headed into a playoff against Rose, only this time he didn’t lose hope. Garcia is no longer that 19-year-old with curly hair and freckles, sprinting up the fairway at Medinah as he tried to chase down Woods in the 1999 PGA Championship. There is gray in his goatee. There are scars from majors. And there was a green jacket on his shoulders. It looked as though it belonged there all along. Published: April 10, 2017, 8:09 p.m.